i just bought my suzuki gs 125 last week, thanks to this forum which help me alot. so far its working very well, n my bike z in running but stil i cant resist to open it on highway, i hope it wont effect engine that much. I'm getting a 6month/6000 km warranty!! wth!! i saw some of the posts and like 4 years back it was like a 24,000km warranty or something? that sounds impossible in today's world! Anybody know what the current warranty period is? i just wanna confirm. I bought my bike in May 2008, at that time the warranty was 12,000kms or 12 months. Sometime last year they reduced it to 6,000kms or 6 months. Most people use Caltex Havoline oil (black pack) with the bikes. Generally, you can use any API SG SAE 20W-50 oil, just make sure you buy it from a well reputed fuel station and not the spares dealer next to the workshop. Also, during running in period, try to variate the rpm, that is, change the speed up and down in the same gear and don't go over 5,000 rpm for the first 500 kms, over 6,000 rpm between 500-800 kms and maybe 6,500 rpm upto 1,000 kms. Get the fuel from a well reputed station, in Pakistan, brand doesn't matter, its the owners and managers who matter. For example, in Abbottabad there is one Shell fuel station (near General Bus Stand) and a PSO station (Qureshi Pump) who are supposed to be better. I bought my bike in May 2008, .... Sometime last year they reduced it to 6,000kms or 6 months. So i'm glad I havent been duped regarding the warranty. Good to know it is actually 6k km/6months but its weird that they would do that when their bikes are quite decent, right? any issues with your bike? I shall definitely variate the rpm, and i'll TRY to keep it below those rpms! at the distances i drive it'll take me at least 40 days to reach 1000 km, might as well wait that long rather than damaging my bike in the long run. It's really cool you're in abbottabad. beautiful city. Thank you ever so much Asad! that was by far the most informative and comprehensive post I have come across yet. Thanks for your clarity in replying to my questions cheers! waranty is for 6 months or 6000kms, what so ever finishes first. i have new gs 125, jst completed 400km and changed the oil, but my bike is giving me mileage of 41/liter, can any one tell ll it increase after first tunning????? i think it should atleast give 45/liter. hi! yup, they told me that at the dealership. for me i think the 6 months will end first. i'll be doing roughly 7000km per year (22 per day, 5 days in the week are fixed ~5300, plus extra ayashi ~1700). After the 1000km training period. the first and second are common sense, the third is what others have reported. Waise, the bikes are pre-tuned with a lean petrol to air mixture (less petrol) so theyre tuned to give lesser performance, higher mileage already. maybe somebody set your mixture a little rich? I would caution you, DO NOT mess around unnecessarily. you may void your warranty and you may destroy your bike, specially in the hands of "anari" mechanics or those who love to experiment too much. Plenty of people like that around. yes try to cover ur meter and ignition switch during service also if ur fuse gets burned replace it with same ratings and never remove it on the advice of daisi mechanics. Front disks r meant for slowing down from high speed in a straight line. Using disk break in a 125 is not a good option because 125 has less weight for disk breaks to operate. disk breaks works best when there is good weight of the engine or in other words works good with a heavy engine like 200 or 250 cc. In a 125 cc bike, I dont think its a good option. I hope you find a good mechanic who can help you diagnose any issues (if any). ouch!! yeah! that wasnt the best idea pushing it that hard in the beginning. it may be why its giving a little less mileage than it should but done worry. maintain it well and it'll still last a good while. I dont have a bike yet bro! i've just read up on the forums a LOT before buying my bike and its gonna arrive tomorrow. but they say you shouldnt push it in the beginning, and i know its true for cars. in the beginning you should take it easy so that the initial engine wear is kept to a minimum, because when an engine is new a little of the inner metal shaves off. push it too hard and a LOT shaves off and thats not good. check your oil for metal filings.... initially in the first 500 km at least there should be some. It happened in the first 100 hours of running for my Honda generator. thats why youre supposed to change the oil in the beginning a lot. I dont know about the rings issue. that seems a little too technical for me. i'm good with engines in general, but i dont have such specific knowledge of bikes. i think what poppat meant to say is that relatively speaking, disk brakes beat all other kinds of brakes, specially for heavier vehicles. and its true! cuz in heavier vehicles, continuous use of the brakes, specially in racing cars makes the brakes over heat and grip less or get damaged easily. Disc brakes stay cooler than other brakes because of those little holes (cross drilled rotors is what they're called). a lot of racing cars have air ducts on the side to draw air towards the brakes to cool them. so basically the heavier the car/bike the more you need disk brakes if you are gonna be braking a lot or very hard. Arguably the Indian GS150R is not the most polished 150cc bike in India. 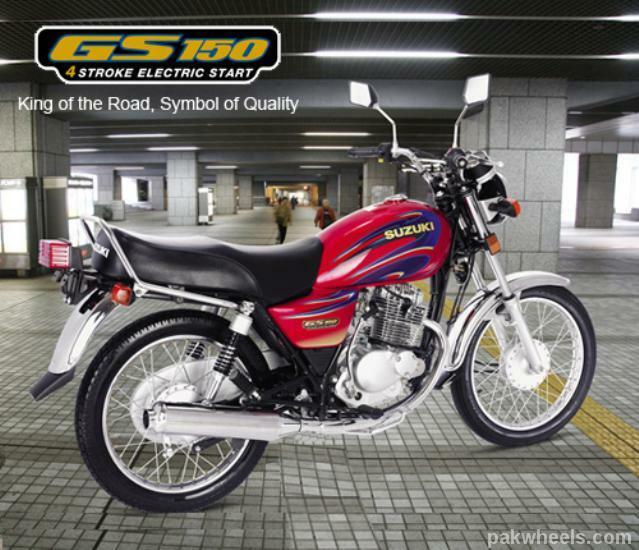 Do we have a better 150cc bike in Pakistan? better than GS150. And we should stop daydreaming, if a bike imported from China costs 85,000, a similar Indian made bike would cost at least 110,000 (although at this time it is impossible to import bikes from India). Thats how the taxes and duties work. I get the point, but its all daydreaming--a Pakistani concern starts R&D for a motorcycle and has produced a bike that gives 100km/l with a top speed of 150km/h looks just like R1 and has a price tag of Rs.50,000, the engine is so simple that the corner bicycle mechanic can fix it--because if it doesn't offer all of the above, people would still say 'Mein tay Honda he laisaan'. You don't get the point, look for Adams and Alifs and Bays on Pakistani roads, and when you see one of these in every ten cars, then think about a Pakistani motorbike. Nobody wants to buy a Pakistani product. One more thing, about a hundred bikers with Internet access on one forum can not do anything, specially when around half of them are still chanting the Honda slogan. @Asad I'm not familiar with the bike scene in India, but I'd be interested in knowing what competitors they have that you feel seem better than.... their GS150R. Importing from India isn't realistic, you're right. About a local R&D concern coming up with something that is aesthetically and functionally amazing and has had alot of thought put into it's design and all.. I think it might be very subjective to say that it'd be guaranteed to fail. Sure there'd be some people who'd say they'd buy a Honda no matter what, but if a local design out-shines it aesthetically and in performance, as time goes on the product overcomes the initial negative bias associated with local products and develops a name for itself. This is a complex topic we're talking about. The biggest hurdle to be overcome isn't the local market's negative bias, it's deeper than that. Hypothetically, say a local concern did set out to make an amazing bike.. what hurdles would they have to overcome. There'd be the govt demanding their 10% cut(TIME magazine gave the guy the "Mr 10%" title in the 80's, I bet the cut is much bigger now). There'd be these companies that make alot of $ selling the same old tired stuff, and they'd be motivated to have any such venture cut off if they can. Who'd protect the little guy from big monopolies with deep pockets and alot of influence over govt legislature, things like that. I guess this also addresses what @umer said, about building our own. I wouldn't say it's impossible, if you're resilient enough to go up against all this and not quit, focus all your energy on finding innovative solutions to each and every hurdle they put in front of you, you'd get through. Afterall, look at what they do to Gaza, it's an open-roof prison with walls around it. And what do the Gazans do? They come with a hammer and chistle at night, break parts of the wall and sell them online :). That personifies resilience for me.